Died: January 11, 1930 in Bourne Ma. at 78 yrs, 1 mo, 25 d.
Married: November 28, 1872 in Sandwich Ma. 1. 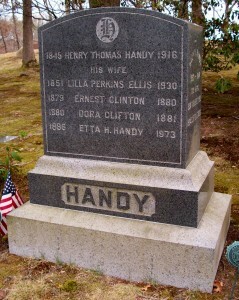 Hermon Putnam Handy; (December 8, 1873 – June 1, 1965); Married Edna Florence Swift (1876 – 1938) (Charles Edwin Swift & Martha Ellis (Adams)) in Bourne Ma. on January 12, 1899; Hermon & Edna are buried in Cataumet Cemetery. 2. Arthur Henry Handy; (June 29, 1875 – May 7, 1956); Married Edith Maude Hall (1877 – 1957) (George Washington Hall & Cornelia/Nellie F. Handy) in Cataumet Ma. on January 7, 1904; Arthur & Edith are buried in Cataumet Cemetery. 3. Ernest Clinton Handy; (July 16, 1879 – March 29, 1880); Ernest is buried in Cataumet Cemetery. 4. Dora Clifton Handy; (August 4, 1880 – June 4, 1881); Dora is buried in Cataumet Cemetery. 5. Robert Sylvan Handy; (September 17, 1881 – July 2, 1972); Married (1) Mary Carleton (1889 – 1956) (John Fisher Carleton & Isabel Augusta Foxcroft) in Bourne Ma. on September 22, 1917 & married (2) Florence Stabener Lane (1887 – 1972); Robert & Mary are buried in Cataumet Cemetery. 6. Anson Burgess Handy; (May 15, 1883 – March 24, 1946); Married Clara Grace Jones (Grace J.) (1887 – 1964) (Addison K. Jones & Clara Emma King) in Belmont Ma. on June 14, 1910; Anson & Clara/Grace J. are buried in Cataumet Cemetery. 7. Etta Howes Handy; (August 4, 1886 – March 4, 1973); Etta was born in Pocasset Ma. & died in Boston Ma. ; She was a School Teacher & is buried in Cataumet Cemetery. 8. Clifton Harrison Handy; (September 8, 1888 – August 1982); Married (1) Edith Glasgow (1898 – 1965) & married (2) Annie Lee (Graham) (1888 – 1972) (Austin Perkins Graham, Jr. & Nina M. Wetherell) in Bay City Mi. on June 14, 1919; Clifton, Edith & Annie are buried in Cataumet Cemetery. 9. Ralph Ellis Handy; (February 18, 1893 – May 22, 1947); Married Annie E. Hart (1894 – 1972) (Edward Marshall Hart & Elizabeth Frances Hewins) in Bourne Ma. on September 15, 1917; Ralph & Annie are buried in Cataumet Cemetery.